I have not mentioned any houseplants for a while. I have not bought many later and the old ones tend not to attract my attention enough to mention. So here is one that I bought a few months ago that has just started to bloom so it is time to give my houseplants an airing. Maybe more will follow if I give them a dusting. 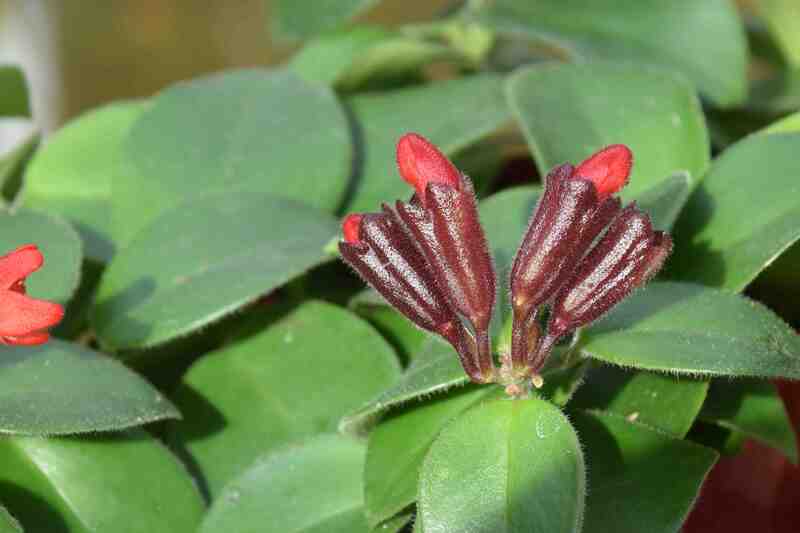 This is the lipstick vine, better called by its (tongue-twisting )botanical name: Aeschynanthus. Although my plant was not named I think it is ‘Mona Lisa’ (also known as ‘Mona’). The flowers are very like A. lobbianus but the leaves are different and are nearer A. obconicus but the calyx is he wrong colour so perhaps it is a hybrid of the two – I am not sure and cannot discover the parentage. Whatever its parents, it is a nice plant with sprawling stems, some of which end in a cluster of four or five flowers. The dark maroon calyces are obvious and quite showy for many weeks before the red buds push through (resembling lipstick) and then open. Aeschynanthus is a genus of gesneriads from the Old World tropics, mostly from SE Asia. 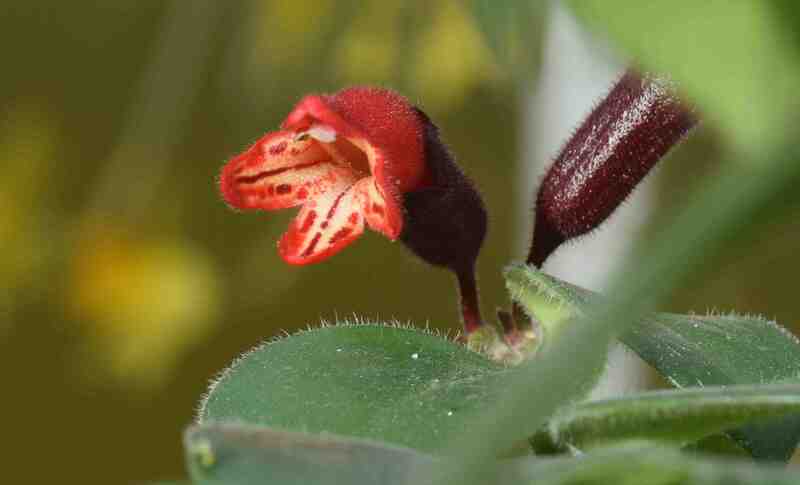 In the New World their place is taken by the similar gesneriad genus Columnea. Gesneriads are fascinating plants and most are not hardy but a few are, including the fascinating, European alpine Ramonda myconii which grows on north-facing cliffs in the Pyrennees and is, effectively, a hardy African violet. 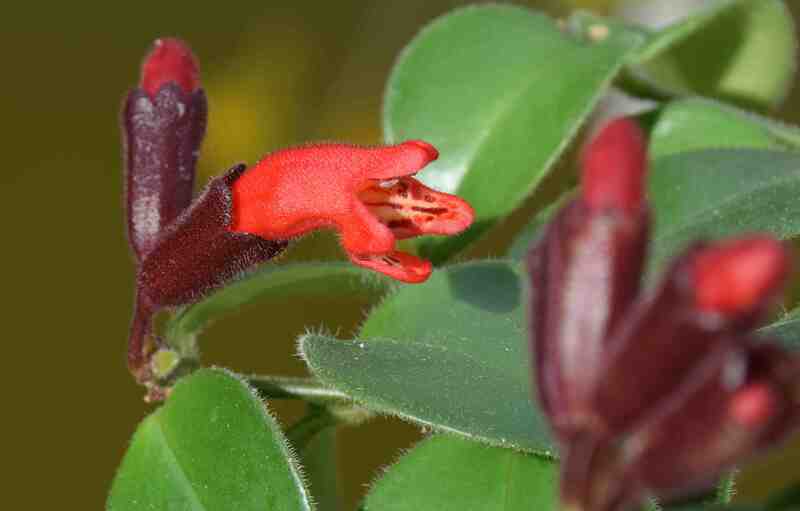 The flowers of aeschynanthus and columneas are pollinated by birds, obvious from their red, scentless flowers and shape, rubbing pollen on the heads of hovering birds supping nectar. They grow as epiphytes, their scrambling stems flowing over branches and because of this, their roots are always perfectly drained. So, in the home, although they like high humidity, they hate to be sitting in water. When watering them it is important that they almost dry out completely before they are watered again. They also like warmth and a temperature of around 20c is ideal for them. It can be colder in winter but it should never drop below 10c. Wet compost and cold is death to them. If looked after well they will send out new stems and more flowers but I suspect that most plants are discarded after flowering. With their lax stems they make good plants for baskets but, since I so not like compost and water on my sofa or carpet I don’t grow houseplants in baskets. It likes good light and mine is beside Sunny’s cage in a west-facing window with his cage between it and the light.